David Cornell hailed the entire Cobblers team for ‘digging in’ and helping him secure a welcome clean sheet in Saturday’s impressive 3-0 win over Carlisle United. Jack Bridge’s second-half double and Junior Morias’s late strike sealed the victory for Town, but it was the hard work and commitment to keep out in-form Carlisle that impressed Cornell. The 27-year-old more than played his part, making a string of good saves when the Cumbrians were at their best in the first half, with his right-handed stop from Jamie Devitt’s stinging volley just before the break the pick of the bunch. His and the team’s efforts secured a first clean sheet since the 1-0 win at Crawley Town on December 8, and only their second in 13 matches, which pleased the Cobblers goalkeeper. “I think we had to dig in at times, which was good, and we kept it to 0-0 at half-time,” said the former Swansea City man. “That was probably fair, because we had chances as well, and then we spoke about being ruthless in both boxes, and in the second half we did that. “Bridgey was great and took his chances well, as did Junior when he came on, and we could have scored a couple more as well. “In terms of defensively, we were great in the second half. We penned them in and I literally didn’t have anything to do, which is great. “It was good to get the clean sheet, and that’s even for the lads in front of us, they deserve that as much as the rest of the team. “I am in goal to make saves, and it is more about the lads higher up the pitch and they did the job on the day. 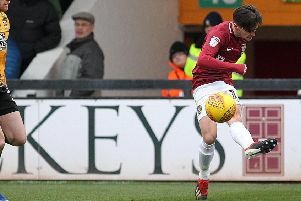 The win was a particularly welcome win for the Cobblers, as they hadn’t tasted victory since that clash at Crawley, and manager Keith Curle had also allowed key midfielder Matt Crooks to be sold to Rotherham United the day before. That sale followed on from the departures of Kevin van Veen and Billy Waters as well, and led to concern among some supporters that the squad was being dismantled without adequate replacements, with only loan defender George Cox coming the other way. But Cornell says he was delighted Crooks was able to seal a deal to the Championship, and said he always believed the squad he left behind had it in them to perform to the required level. “Crooksy is a great lad, and he has been great since he has been here,” said the Town goalkeeper. “If a Championship club comes in then it is obviously difficult, because he wants to further his career and all the best to him. And then then went on to praise the spirit within the Cobblers squad, adding: “I love coming in every day. “This is a good group of lads, the staff are a pleasure to work with, and I think you can see that, or at least I would hope people can see that from the outside as well. The Cobblers return to Sky Bet League Two action on Saturday when they travel to Cambridge United.